The City of Nanaimo operates its own curbside collection program. How do new residents access the garbage, green bin and recycling program? If you are moving into an existing single family home, you will likely be on the program. If you have built a new house, you will automatically be put on the program when your occupancy permit is issued. Where do I get a collection schedule? A collection schedule can be picked up from the RDN Administration office at 6300 Hammond Bay Road, Nanaimo or from Waste Connections of Canada - 1151 Herring Gull Way, Parksville or Click Here to view your collection calendar online. Where do I get a green bin, blue box, and yellow recycling bag? Blue boxes can be purchased from most hardware stores. 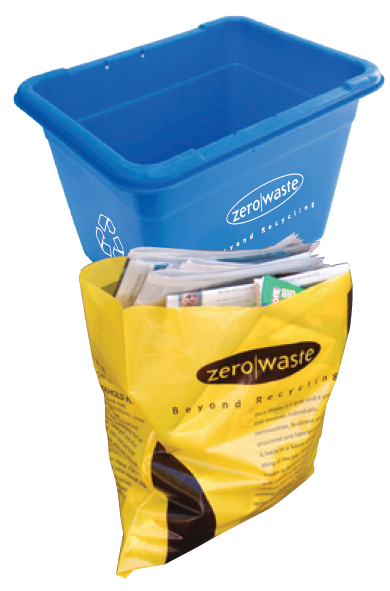 A yellow recycling bag for your newspaper and other household papers is provided free of charge and is available from your municipal office, RDN Solid Waste facilities, Waste Connections of Canada and the Lighthouse Feed and Garden store. What is the RDN Curbside App? The RDN Curbside app allows you to keep track of when you have a curbside pickup. The app also provides a list of materials that go into your green and recycling bins and lets you search where material that you are unsure of goes. To download the app, go to Google Play or the App Store and search for "RDN Curbside". Download the app and enter your address and set up the time for reminder and you will never miss a pick up again. Please see Schedule 'A' of Bylaw 1591 for current rates. The program is paid for by user fees and no taxes are used. Program costs include contracted pick-up, waste disposal, administration and communications. No, the program is mandatory. How much garbage can I put out? Basic service allows for one standard-size 100 litre garbage can or bag to be collected once every two weeks with a maximum weight of 50 lbs or 23 kgs. Why is there a one-can basic service? The one-can garbage limit or basic service makes people responsible for the cost of the garbage they produce, and encourages waste reduction and participation in the green bin and curbside recycling programs. This has contributed to our success in diverting waste from the landfill. By participating in the green bin and curbside recycling programs our customers can easily accommodate the one-can limit. What if I have more than one can of garbage? 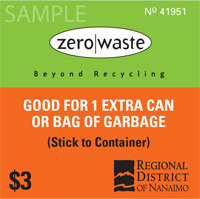 Tags for extra containers of garbage may be purchased for $3 each. A maximum of two additional containers may be put out on your scheduled collection day, if a garbage tag is attached to each additional container. A new Province-wide program developed by RecycleBC has expanded residential recycling in the region. Starting May 19, 2014, additional items will be accepted in curbside recycling. These new materials include milk cartons, aseptic boxes (Tetra-Paks for soups, sauces etc. ), frozen juice cans, empty aerosol cans (not spray paint), plastic drink cups and lids, as well as plastic garden pots and seedling trays. Please note that some items are not accepted in the curbside recycling collection. These items include: soft plastic (such as plastic bags and plastic wrapping); household glass containers; Styrofoam packaging (cushion packaging and food trays); and textiles. Soft plastics, Styrofoam and household glass containers can be taken to a depot. What is accepted in the curbside recycling collection program? Household plastic containers, newspaper, mixed paper, cardboard, magazines, metal food and beverage containers, foil containers and trays are accepted in the RDN curbside recycling program. For detailed information on materials accepted and how to prepare them, refer to the Curbside Collection Guide. Click here to download a copy, or use the What Goes Where? tool. Why is glass not collected in the curbside recycling program? When glass is collected as part of the curbside program, the glass often breaks, contaminating the load and causes a hazard for our drivers and the workers at the sorting facility. If the load because contaminated with broken glass it may not be sorted through and may end up going to a landfill. Glass can be taken to many location in the regional district. Use the What Goes Where to find the location closest to you. Deposit or refundable glass containers such as pop, juice, wine, beer, and liquor bottles should be returned to Return-It Centre for refund. What are the acceptable plastics? Most rigid (not film or foam plastic) household containers are accepted. This includes all containers such as soap, yogurt, shampoo, cleaning, spreads and condiments, dairy, and plant and garden containers. Not accepted are containers that contained motor oil, lubricants and antifreeze, and deposit beverage containers which should be returned to a Return-it depot. Why is it necessary to break down and bundle cardboard? So that it fits easily into the collection vehicle and so drivers can quickly and efficiently pick it up and throw it into the truck. Is there a limit on the amount of recyclables that can be put out? Any reasonable amount of recyclables will be collected. If you are generating excessive amounts of recyclables then limits may be placed, but only on a case by case basis. Where do I get a blue box or a yellow bag? How much does one cost? Blue boxes can be purchased from most hardware stores. Yellow recycling bags are available from Waste Connections of Canada, from the Regional Landfill, from the RDN Administration and your local municipal offic. There is no charge for yellow recycling bags. Where are the drop-off sites for recycling? There are many drop-off recycling opportunities in the RDN. This link lists the depots accepting a wide range of RecycleBC items as well as soft plastic, household glass containers and Styrofoam packaging. Check the RDN on-line What Goes Where for where to take a wide range of other items not accepted at the curb. Where can I get a new or replacement green bin? If you are new to the area and need a green bin, or if an older bin has become damaged and unusable, locations selling new green bins stamped with the "Beyond Composting" logo can be found here. What is the Green Bin Program? The Green Bin Program is a curbside service that collects residential food and kitchen waste (food scraps and food-soiled or wax-coated paper products). A local licensed composting facility converts food waste into fertilizer and compost. Using a green bin is an easy way to send less garbage to the landfill, turn food waste into a renewable resource and help reduce greenhouse gas emissions. Food waste collection enhances home composting and complements recycling, providing a service that enables households to divert 70 percent of their waste from the landill. For detailed information on acceptable materials and how to prepare them, please refer to the Curbside Collection Guide. Why have the RDN and its member municipalities introduced the Green Bin Program? What materials are accepted in the Green Bin Program? Materials accepted in the green bin include plate scrapings, meat, fish and poultry, bones, dairy products and wax-coated or soiled paper products such as paper towels and tissues. These materials are unsuitable for home composting. What are my green bin food waste, garbage and recycling collection days? Check your printed Food Waste, Garbage and Recycling schedule or on-line at Garbage and Recycling Schedules for your collection days or to set up collection reminders using the RDN curbside app. The app can be downloaded from your app store. If you do not have a schedule and cannot access the internet call 1-866-999-8227 to have a schedule mailed to you. Why do I have to have my food waste, garbage and recyclables out by 8 a.m. when the truck doesn't come by until later in the day? The order that the contractor does the routes can change without notice. The contractor is obliged to collect your waste on your collection day but the time is not specified. If you put your green bin, garbage or recyclables out after 8:00 AM and the truck has already passed your house, it will not be picked up. What happens to my collection day after a holiday? Garbage, recycling and green bin collection schedules follow an add-a-day system. After each statutory holiday that falls on a weekday (Mon. - Fri.) your collection day will advance by one day. For example, if your collection day is Wednesday, and Friday is a statutory holiday, your collection day will move ahead to Thursday the following week. If you are unsure of your collection day, check your schedule. What happens if it snows and the collection truck can't get down my road? Severe winter weather, such snowy and icy conditions or roads blocked by downed trees or power lines, may cause the contractor to temporarily cancel food waste, garbage and recycling collection. Please see Adverse Weather Disruption to Collection Service for details. Call 1-866-999-8227 for detailed information. You can also download the RDN curbside app from your app store. The app will provide additional notifications related to curbside pickup. How often is my food waste, garbage and recycling collected? The green bin is collected every week., garbage and recycling is picked up every other week. I have a vacation home that is unoccupied most of the year, why do I have to pay for food waste garbage and recycling collection for the whole year? Unfortunately, we have no way of knowing whether a property is occupied or not and have no ability to adjust your bill accordingly. The administrative work required to keep track of occupancy of every residence would be significant and likely increase the cost of service. I have a rental property that is vacant, why do I have to pay for garbage and recycling collection? It is impossible for our billing system to track of the occupancy of rental properties. The administrative work required to keep track of occupancy of every residence would be significant and likely increase the cost of service. If the dwelling is habitable, that is, has electricity, running water, plumbing and heat, the owner will be billed for collection services. Why did I receive a bill belonging to the previous owner of the house I've bought? At the time of billing, utility bills are sent to the owner of the property on record. We update our records with new owner information when a lawyer/notary contacts us for information to do a conveyance. The statement of adjustments that you receive from your lawyer/notary should show an adjustment for a portion of this bill. Please contact them directly if this adjustment was not done. I sold a house last year, what should I do with this bill? Please return the bill to the Regional District of Nanaimo, so that we can research ownership, update our records and re-direct the bill. Why can't you send the bill to my tenant? It is RDN policy to bill the property owner. It is between the owner and the tenant as to how that cost is passed along. The property owner is ultimately responsible for the bill, and if unpaid at year end, it will be added to property taxes. Who is served by RDN Solid Waste Disposal Facilities and programs? Who is responsible for collecting and disposing of my waste and collecting my green bin food waste and recyclables? The RDN has the mandate for solid waste management and operates the garbage disposal facilities and residential garbage and recycling services in the regional district. Depending on the location and type of dwelling, your waste collection may be provided by the RDN, your municipality or in the case of apartment buildings and condominiums, by a private contractor. All garbage collected in the RDN is eventually disposed of at the Regional Landfill, the only solid waste disposal facility in the region. Recyclables are sorted and processed at the Vancouver Island Recycling Centre and food and kitchen waste at the Nanaimo Organic Waste composting facility at Duke Point in Nanaimo. Where are the RDN disposal facilities and when are they open? The Regional Landfill is located at 1105 Cedar Road, Nanaimo and is open Monday to Sunday, 8:00 a.m. to 5 p.m. It is closed on statutory holidays. The Church Rd. Transfer Station is located at 860 Church Road, just west of Parksville and is open Monday to Sunday from 8:00 a.m. to 5:00 p.m. It is closed on statutory holidays. For more information, visit the Solid Waste Disposal Facilities. Why are there charges to drop off waste? Garbage costs money to manage. With increasing environmental protection standards and increasing fuel, labor and equipment costs, modern waste management is an expensive business. To pay for safe and responsible garbage management there are only two possible revenue sources: taxes or user fees. The RDN has chosen to finance the operation of its Solid Waste Disposal facilities with user fees. Why are user fees used to fund garbage disposal instead of taxes? If we all produce garbage, shouldn't the cost be shared equally amongst our citizens? Using taxes to fund garbage collection and disposal is unfair. Paying for garbage with taxes removes a powerful incentive to reduce waste and explore alternatives to expensive waste management and disposal. Using taxes to fund garbage collection and disposal creates the impression that garbage disposal is free, distorting costs and devaluing the service. A tax based system forces those who produce little waste to subsidize those who produce a lot of waste. User pay garbage disposal is a very simple system; if you make more garbage you pay more, if you make less garbage you pay less. Wouldn't people rather have a simple tax based system that they can use for free? No. User pay is overwhelmingly supported by the citizens of the RDN. A survey conducted in 2000 showed 79% of residents supported a user pay system for garbage. With user pay garbage disposal, how much one spends on disposal can be controlled and wise businesses and individuals can virtually eliminate disposal costs through waste reduction, reuse and recycling. Doesn't charging for waste encourage illegal dumping to avoid charges? No. Studies and our local experience showthat there is not a strong connection between disposal fees and illegal dumping. The most recent information indicates that those dumping illegally are mainly marginalized members of our community and often dump illegally simply because they are unaware of the proper disposal procedures or are unwilling to do the right thing. Is a goal and a process that involves individuals, communities and local, provincial and federal governments and a vision of a future where garbage is a thing of the past. Is a movement that began with asking the simple question, "Why have our recycling efforts hit a plateau? One reason is that after targeting 50% diversion and achieving it, people had lost interest in going further. It was clear that further gains in waste reduction and recycling could be achieved but that the will to pursue them was lacking. Inspires us to revisit our goals and apply our knowledge to the problems that persist. Once the possibility of Zero Waste is accepted, all waste looks different. Is about acquiring the wisdom that we all need to be responsible in our use of resources and our impact on the planet. Is the Regional District of Nanaimo the only organization pursuing Zero Waste? No. The Cowichan Valley Regional District, Regional District of Kootenay Boundary, Metro Vancouver, Toronto and many more have declared Zero Waste as their long term waste management goal. New Zealand is a leader in Zero Waste with the majority of its local councils declaring Zero Waste as their goal. A number of large corporations in the U.S. have set Zero Waste goals. This is a common sense idea that really engages people. It's impossible to totally eliminate waste so why bother with the Zero Waste idea? Many important objectives may be impossible to achieve completely like eliminating traffic fatalities but the goal remains worthwhile. While it may seem impossible to achieve Zero Waste, it remains a worthwhile long term goal to improve the health of our environment and conserve scarce resources. What is wrong with the 3R's (reduce, reuse, recycle)? Nothing. The 3R's have increased awareness of how the waste we generate impacts our environment but have become primarily associated with recycling. Greater awareness around reducing and reusing is needed to move beyond recycling. Zero Waste is a broader concept that re-emphasizes waste reduction. Zero Waste seems to call for cutting back. Won't this eliminate jobs and economic prosperity? No. With most changes, economic activity shifts, but is rarely eliminated. Our garbage has value; Zero Waste is about ReThinking Waste, recognizing and utilizing that value and creating local jobs instead of landfills.